Talks between Taiwan and the US under the bilateral Trade and Investment Framework Agreement (TIFA) will likely not be held this year, as the administration of US President Donald Trump has yet to fill the vacant deputy trade representative posts, Minister Without Portfolio John Deng (鄧振中) has said. The talks have been conducted by the two nations’ deputy trade ministers since 2004, said Deng, who also heads the Cabinet’s Office of Trade Negotiations. However, three deputy representative positions at the Office of the US Trade Representative are vacant, and while the Trump administration has named people to take those positions, they have yet to be confirmed by the US Congress, Deng said. Even if it quickly approves the nominations, “there will not be time to hold [the TIFA talks] this year,” given the time it takes to process the appointments at an administrative level, Deng said. Taiwan and the US, one of the nation’s largest trading partners, signed the bilateral trade agreement in 1994. The two sides have held 10 rounds of trade talks since then under the TIFA platform, the most important negotiating channel for high-ranking trade officials from the two nations. In 2004, the TIFA talks were elevated to a meeting led by officials at the deputy ministerial level. The most recent round of the talks was presided over by Vice Minister of Economic Affairs Wang Mei-hua (王美花) and former deputy US trade representative Robert Holleyman. The first TIFA meeting was held in Taipei in 1995, and Taipei and Washington hosted the meeting on a rotating basis in 1997, 1998, 2004, 2006 and 2007 before a five-year hiatus from 2008 to 2012 due to disputes over imports of US beef to Taiwan. 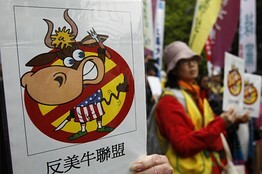 The meeting was resumed in 2013 after Taiwan approved imports of US beef containing residues of ractopamine, a feed additive that promotes leanness in animals, but is banned in Taiwan and many other nations because of safety concerns. The talks have been held each year since then. Over the past two decades, issues brought up at the Taiwan-US trade talks have included Taiwan’s WTO membership, and its bids for a free-trade agreement with the US and participation in the Trans-Pacific Partnership.